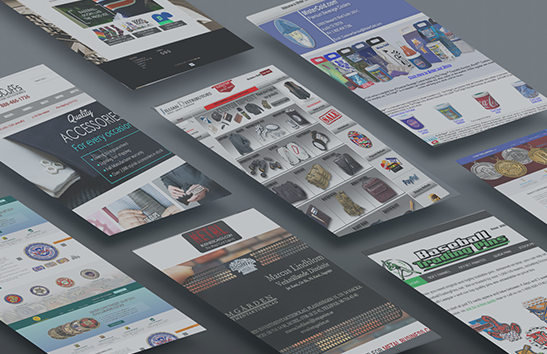 SZ Ventures acquires and optimizes e-commerce websites through innovative strategies and sourcing from quality manufacturers. Once we acquire an internet business, our team of highly qualified personnel will perform operational activities such as developing website content, stimulating growth through onpage/offpage SEO strategies, optimizing paid acquisition tactics such as AdWords/Facebook campaigns, providing friendly customer service and creating value through affiliate partnerships. Additionally, our team will research industry trends to stay ahead of the retail curve and source low-cost high-quality manufacturers domestically and internationally. 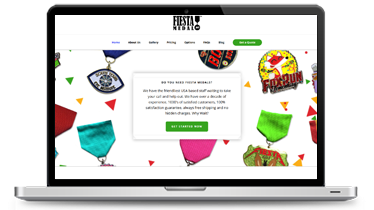 Fiestamedal.net manufacturers custom military medals for Fiesta San Antonio. Each year, thousands of people get together in San Antonio for the Fiesta Festival and we help produce several of the millions of fiesta medals passed around during the event. Uberpong.com produces custom ping pong accessories for the novice and expert ping pong player. Add your face or logo to a ping-pong paddle or ball, and take your game to the next level! We also make custom ping pong tables, beer pong cups and balls! 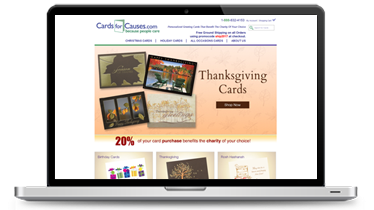 Cards for Causes offers an extensive selection of custom imprinted, high quality, charitable cards that are perfect for you to send to customers, suppliers, employees, family and friends. During the course of the year, virtually everyone and every business needs to order greeting cards such as holiday cards, thank you cards, birthday cards or invitations and announcements. What a great way to purchase something you need and in the process let us make a generous donation to a worthwhile cause that needs your support. Every time you place an order with Cards for Causes, we donate 20% of that card price to the charity / cause of your choice. SocksRocks makes custom socks for sports teams, businesses and non profit organizations. We are the leaders in creating baseball stirrups and our technology allows you to create custom socks right at your fingertips on our website. Metal Promo is a world class promotions company, specializing in customized metal goods including lapel pins, medals, key chains, coins, cards, golf tools, badges and other promotional items. We work with companies, organizations and teams across the world, to provide high quality designs on the finest quality metal products. The unique products are given out for sports tournaments, commemoration, awareness and achievements and other events. 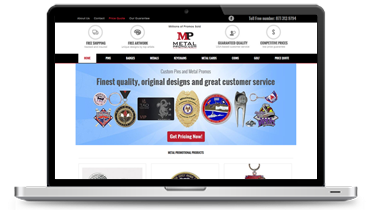 MetalPromo is also the parent company of 20+ niche promotional websites. ProCuffs carries fashionable Men’s accessories including cufflinks, tie clips, watches, wallets, bracelets and more. We have some of the most unique cufflinks in the world and manufacture most of our products. We have partnered with many fashion designers globally to bring trendy stylish accessories to our customers. MisterCold is a one-stop shop for premium beverage coolers. We are the largest reseller of the patented Lifoam Freezable koozie and Collapsible cooler Koolits. Some of our largest clients are world-renowned PGA golf courses. We also carry reusable ice cubies, wine coolers, and ice wraps. Metal Business Cards manufactures and designs luxurious stainless steel cards, metal bottle opener cards, metal invitations, metal dog tags and unique metal products. We are well renowned for our innovative yet unique business card solutions and our team comprises of expert graphic designers and a talented metal production team who are committed in producing the highest quality and most extraordinary metal cards guaranteed to create a long lasting impression. Our business cards offer endless customization options including etching, printing custom cutouts, unique shapes, and any other option you can think of. So stand out from the crowd and help increase the sales of your business. Jillian Distributors is a wholesale distributor of over 100 product categories from motorcycle gear to home and garden to electronics to many more! JD is known for their high quality leather products and carries over 3,000 products. All items come direct from our partner factories in Pakistan, India, and China. Custom Challenge Coins designs and manufacturers Challenge coins for the Military, Navy, Firefighters and policemen. We also make coins for corporations to use as commemorative pieces. Custom Medal designs and manufacturers custom medals for races, ceremonies and competitions. We provide a full spectrum of customization medals including 3-d medals and custom printed ribbons. Plugged Inc. is a premium audio brand built to bring better music experience to its consumers. Plugged uses superior sound qualities with a custom 40/15 driver system to deliver tonal balance with aggressive bass, strong mids and clear highs. Designed with iconic aesthetics, these headphones are available at a fraction of competing products. Plug in. Fade out with Plugged Inc.
Flexz Fitness is a premium Gym Apparel Company geared towards gym goers. With the expanding popularity of the fitness world, Flexz Fitness provides high-end fashion that is suitable for in and out of the gym. With inspiration taken from the world of Street Culture and fashion, Flexz Fitness has set the trend with its high quality material. Flexz gym line includes singlets, tank tops, sports bras, lifting belts, hand wraps and fitted shirts. Reach the next level of your game by not only focusing on performance, but comfort as well. Baseball Trading Pins is a leader in manufacturing and designing custom Baseball trading pins. Trading Pins have long been an integral part of many baseball tournaments and team sports all across the country. There is no better way to show your team spirit and spread the word about your team than with lapel pins. In the last 10 years our talented graphic designers have produced artwork for over 10 million pins, and they really know what works well – and makes a sought-after trade. However, what really sets us apart is our quality, service, and price! © 2017 SZVENTURES, All rights reserved.